Harmony Books, 2011. First published in the United Kingdom in 2008. 319 pages. 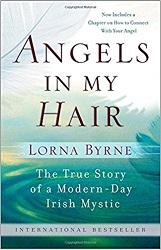 Ever since she was a little girl, Lorna Byrne has been able to see angels and other spirits. This book tells her story. And it’s lovely. When I was a baby, my mother noticed that I always seemed to be in a world of my own. I can even remember lying in a cot – a big basket – and seeing my mother bending over me. Surrounding my mother I saw wonderful bright, shiny beings in all the colors of the rainbow; they were much bigger than I was, but smaller than her – about the size of a three-year-old child. These beings floated in the air like feathers; and I remember reaching out to touch them, but I never succeeded. I was fascinated by these creatures with their beautiful lights. At that time I didn’t understand that I was seeing anything different from what other people saw; it would be much later that I learned from them that they were called angels. As the months passed, my mother noticed that I’d always be looking or staring somewhere else, no matter what she’d do to try to get my attention. In truth, I was somewhere else: I was away with the angels, watching what they were doing and talking and playing with them. I was enthralled. I was a late talker, but I had been conversing with angels from very early on. Sometimes we used words as you and I understand them, but sometimes no words were needed – we would know each other’s thoughts. I believed that everyone else could see what I saw, but then the angels told me that I was not to say anything to anyone about seeing them, that I should keep it a secret between us. In fact, for many years I listened to the angels and I didn’t tell people what I saw. It is only now in writing this book that I am for the first time telling much of what I have seen. The author writes all about growing up with angels around her and about her marriage and children. She didn’t write the book until her children were grown. Now people come to her from all over, asking for prayer. Her perspective is lovely. I like the way she talks matter-of-factly about how there are always lots of angels around places of worship – churches, synagogues, and mosques alike. She also talks about souls that stay around after death to comfort their loved ones, or come back to comfort their loved ones. In fact, one of the first spirits she saw, and played with, was her older brother Christopher, who died as a baby. She sees different kinds of angels – and tells us that everyone has a guardian angel who is with them all their lives. She says the angels are there to help, but they don’t help without consent. They also often try to influence people to do something – but not everyone listens. Angels are not just found in Christian churches; they are in the synagogues, in mosques, and in all the holy places. Your religion makes no difference to the angels; they have told me that all churches should be under one roof. Muslims, Jews, Protestants, Hindus, Catholics, and all the other different religions should be together under one umbrella. We may look different, we may have different beliefs, but we all have souls. There is no difference between a Muslim soul and a Christian soul. If we could see one another’s souls we would not be killing each other over different interpretations of God. There are several times in the story when she knew ahead of time that someone was going to die – and she saw the angels take extra loving care of that person’s soul. Now, she does talk at times about evil spirits. But in an encouraging way. Because God and the angels are stronger. Sometimes a person will let Satan enter their life. This can happen through deliberate, malicious intent or through feelings of jealousy or anger, or a perception that life hasn't been fair to them. For example, Satan frequently gains access to individuals when there is a dispute over property or a will. The extent to which Satan can darken a soul varies; his influence may give an individual what appears, externally, to be a great life, but the lives of those around them will be damaged; ultimately, if nothing is done the soul of the person involved will be destroyed. Growing spiritually - reconnecting with God and the angels, and letting God's love and compassion back into the heart - is the only way of driving out Satan. The angels will help when you ask them. It doesn't even have to be the person who was affected who asks: a family member or friend can also pray for help, and I have seen many occasions where this has worked. It's worth remembering this when you come across evil in your own life: a prayer from anyone, of any belief or background, can and does make a significant difference. It’s all very lovely. It doesn’t match what I was taught about angels, exactly. But it does ring true, and these angels she describes are beings of light and love. I do believe that God is always with me. And I intellectually have long believed that He sends His angels to help me. Reading this book made that seem infinitely more personal. What a gift!